Lausitz Energie Kraftwerke AG is the owner of the Lusatian lignite-fired power plants Jänschwalde, Schwarze Pumpe and Boxberg. They are exclusively supplied with lignite from our nearby opencast mines. Furthermore, we operate the power plant Lippendorf near Leipzig and own one of the two units. The annual electricity production of our power plant fleet could supply about 15.9 million households with reliable power. In Addition to electricity, we also generate about three billion kilowatt hours district heat annually to supply thousands of households and municipal facilities such as hospitals, schools and offices. The supply takes place in close vicinity to our sites for example in Leipzig and the Lusatian towns of Cottbus, Spremberg, Weißwasser and Hoyerswerda.Our third product is process steam available for industrial customers. 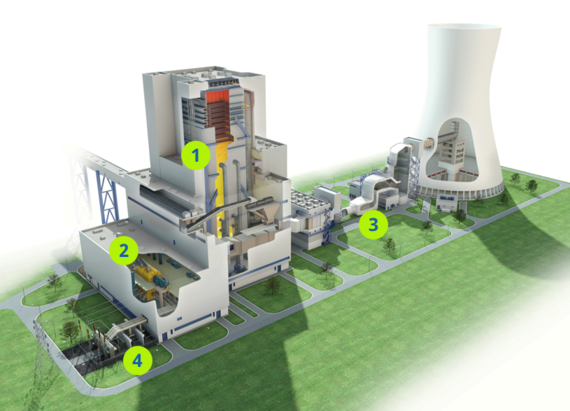 How does a lignite power plant work? The lignite is stored intermediately in coal bunkers on the power plant site. From there it is transported with conveyors inside the plant. It is then crushed, dried and milled to dust. This is blown into the combustion chamber of the boiler. Here the lignite dust is burnt and heats water in the pipe system to produce large quantities of steam. The high pressure steam is then guided on to the impellers of the steam turbine which forces the turbine shaft into a rotary motion. In the turbine there are high pressure, medium pressure and low pressure stages. These are designed in such a manner that the energy of the stream, that diminishes on the way through the turbine, can be used optimally. On the other end of the shaft a generator converts energy of the rotary motion into electrical energy. This happens in a similar way to a dynamo on a bicycle. The electrical energy is transported via overhead lines to the transformer stations from where it is fed into the extra-high voltage grid. The German energy supply is undergoing a period of fundamental change: The expansion of renewable energies and the phasing out of nuclear energy by 2022 are the two main objectives of the 'Energiewende' (energy transition). Our lignite power plants accompany this process. On the one hand, they offer a reliable round-the-clock supply and on the other hand, they are flexible and capable of adjusting their own production to the current available one of the renewables which has priority in the transmission grid. When there is a high feed of renewables into the grid we can reduce the output of the power plant units to as a low as between 20 and 40 percent of the installed capacity. If the production of the renewables falls again, operations are ensured by throttling down to idle mode which enables a rapid increase of output. The amount of electricity being produced out of renewable sources is increasing. But currently there is insufficient grid capacity to transport the electricity. Furthermore, large scale economical storage possibilities for electricity have still to be developed. Without these the intermittent generation of energy from renewables would not be able to secure a round-the-clock energy supply. Therefore for the foreseeable future conventional combustion power plants will be needed to ensure a guaranteed electricity supply. Here lignite offers an import independable and cost-effective supply. When fossil fuels are burned CO2 is created. In the atmosphere it contributes to the green house effect. As increased emissions are regarded to be jointly responsible for global warming, the emissions are supposed to be worldwide drastically decreased. Our power plant fleet has reduced about 46 percent of its CO2 emissions refering to the year 1990. Thus we have already reached the Federal government´s 2020 reduction aim based on 1990 emmissions for Germany some time ago. This reduction was reached by investing billions in efficient technology but also by decommissioning numerous power plants and industrial enterprises after the wall fall. The lignite based energy production is situated inside the parameters stipulated by the European climate policy. All power plants are subjected to the European trade with emission certificates. The trade with the certificates limits the CO2 emission effectively that may be emitted by the involved industries (thermal power plants, parts of the industry). Flue gas is produced during the combustion of lignite; this is cleaned by using modern emission reduction technology and is expelled with process-based water vapour over cooling towers. With this method we were able to significantly reduce the environmentally emissions of oour power plant fleet in the past twenty years. All our power plants undercut in all operational states the legally required limits. Continuously monitoring measuring instruments record the significant emissions of a power plant. The responsible environmental authorities monitor that limits are complied with online.